First post, and a recap of what has been done so far. 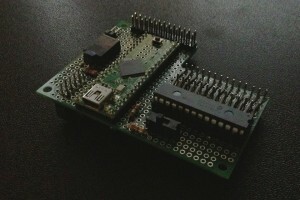 Prototype interface board has been built. It is based around an Arduino compatible Teensy++ development board which contains a AT90USB1286 microcontroller. The main reason why I went for the Teensy instead of any other Arduino compatible board was the transfer rate of the USB compared to the real Arduino boards (benchmark). There is a PIC processor on the Minimig which acts as an IO controller. This is convenient since I could just remove it and use the socket as an input for my board. The PIC processor itself was relocated to sit on the interface board instead. 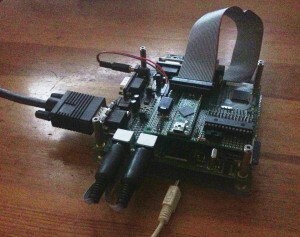 The interface board is the glue which binds the Minimig together with the PowerPC. I can talk to it from MorphOS over USB, and it in turn can control the Minimig and the VGA switcher hardware. So far I can power the Minimig on and off, reset it, and feed it with mouse/keyboard/gamepad input coming from the MorphOS side. It can also control a VGA switch to switch between displaying MorphOS and the Minimig on my monitor. Next up on the software side is to control floppy disk mount/unmount and in the long run be able to either deploy floppy images to the Minimig SD card and/or “stream” floppy disk content from MorphOS to the Minimig. Hardware is done on prototype board. It would be cool to make proper PCBs when everything is fully finalized but that is still far in the future.